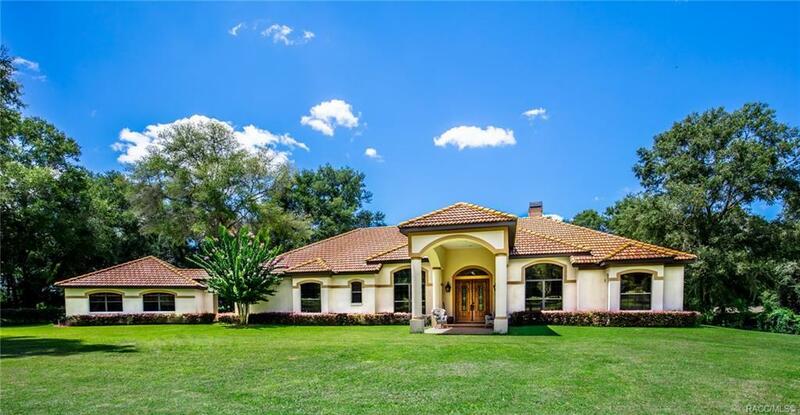 Estate Custom Home on 10 acres with selctively cleared pasture and live oaks! Enter into this homes spacious great room featuring 12 ft high cathedral ceilings, fireplace and wet bar. This open concept is immediately joined by the kitchen, dining and breakfast nook. Quality maple cabinetry and granite tops are through out the home. This is a dream kitchen with abundant storage and counter space including stainless appliances and a gas range! Large master suite overlooking the pool and back meadow with walk in shower, jacuzzi tub and seperate his/her vanities. French doors draw you to the large 80 ft screened lanai and a 14 X 28 pool featuring a fountain hot tub. Other feautures include tile roof, office/den, 2nd master suite and detached 25 X 25 studio with 1/2 bath. This property is completely fenced with small horse barn. This home and property is perfect for the most discreet buyer that demands unrestricted beauty, seclusion, privacy and convenince! A must see!